As a specialist recruitment agency, our strengths and core focus lie in delivering a service of excellence through thoroughly understanding our client’s requirements and company culture. We work in the African region in the following Heavy Industry sectors: Mining, Engineering,Project Management. We service the Logistics and Supply Chain industry by default in Africa as it is such an integral part of the continent, and heavy industry. With 9 years international recruitment experience gained in the U.K as well as in Africa, we are driven to make a difference to the industry and target excellence in all that we deliver. 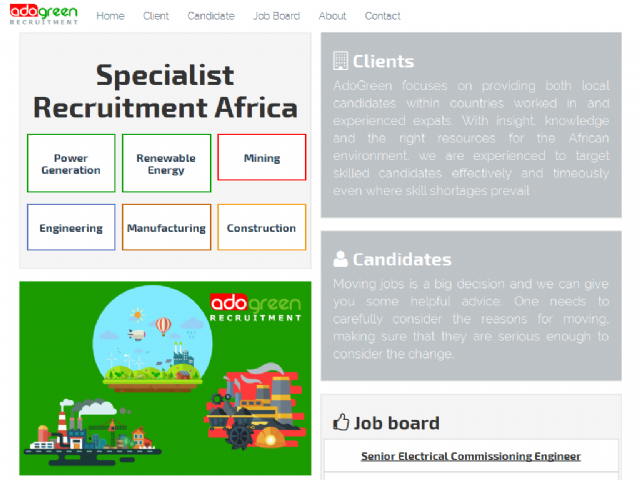 At AdoGreen, we begin with understanding an organisation’s precise requirements before engaging in an appropriate strategy for a managed recruitment assignment. Our methods are characterised by a professional, thorough approach that places the emphasis on client and candidate care alike. Our goal is to exceed every expectation and to provide a creative solution that delivers positive and long-lasting results both for our clients and candidates. We believe that doing what is right is more important than telling you what you want to hear.